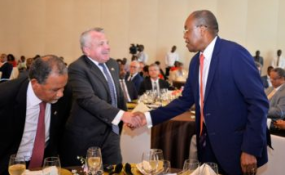 U.S. Deputy Secretary of State John Sullivan at Trade and Investment luncheon in Luanda. Thank you, Ambassador, for that introduction and to you Maria, I also would like to thank, as the Ambassador said, the U.S.-Angola Chamber of Commerce, and AmCham Angola, and of course Chevron for sponsoring this event. Good afternoon everyone, and thank you all for the warm welcome and for joining me here today. This is my first trip to this beautiful country, and it’s a real pleasure to be here in Angola. Security institutions must be effective, accountable, and capable for African governments to respond to regional threats to peace and security. That’s why we have provided peacekeeper training and equipment to over 20 African countries.? We are encouraged by Angola's deployment in support of regional peacekeeping efforts in Lesotho; and by Angola’s leadership in encouraging the Democratic Republic of the Congo in its first-ever political transition of power. We value Angola as a security partner, and have worked with Angolan and regional maritime forces in combatting privacy [piracy], oil bunkering, and illegal fishing. Our partnership has resulted in increased sub-regional and international cooperation to strengthen maritime security, which includes the security of many of the oil companies represented here today.